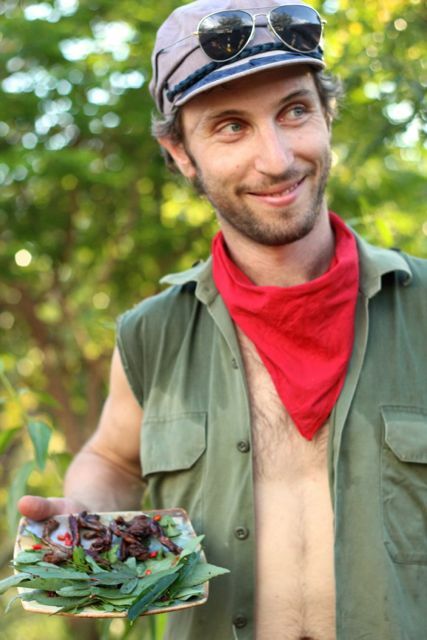 Toad legs- the new feral fine food? In the past the GULP team have discussed the various contents of the cook book that will emerge from this wonderful community based local food project. We would like to set the book out to be produce focused and look at the ingredients that we grow, then from this the recipes are written, and include a ‘star rating’ of how local the recipe is overall. The subject that has arisen a lot, is if we should include meat. Aside from the fact a couple of the team are veggie, semi- veggie, we want the book to appeal to all tastes and reaslise and a lot of people do want to eat meat. The problem is at the moment in the Top End there is no abattoir and the Brahmin cattle that are run in the bush are (sadly) live exported overseas. Many people keep chickens and we would like to include how you can kill and eat these. Many people catch fish and wonderful local fish and seafood is available, so we would love to include this and what ‘sustainable’ seafood is. From here though the two other sources of meat are wild hunted and road kill- unintentionally killed animals, native or not that can make good tucker. In the Territory and Top End there are many feral animals, buffalo, pigs, even goats and donkeys further towards Mataranka- all fair game for hunting and eating (OK- so you need permits, heck out the land you are on etc. but you get the drift). 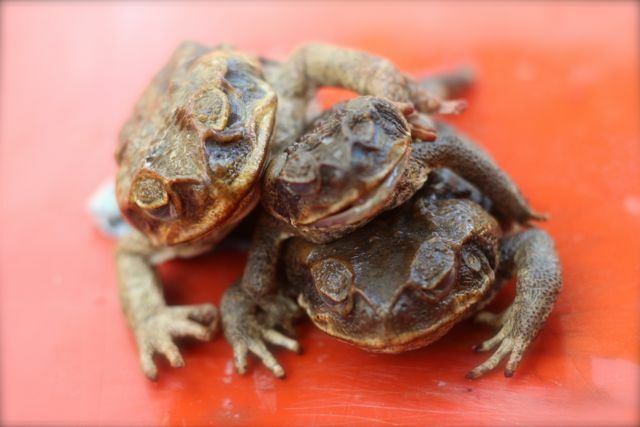 One feral animal that is often overlooked as something to end up on your plate is the cane toad. Cane toads, (Rhinella marina) formerly Bufo marinus, are native to South America and were introduced to Australia as another awesome idea at the time, but now disastrous for our biodiversity, introduced by Australian Government in 1935. 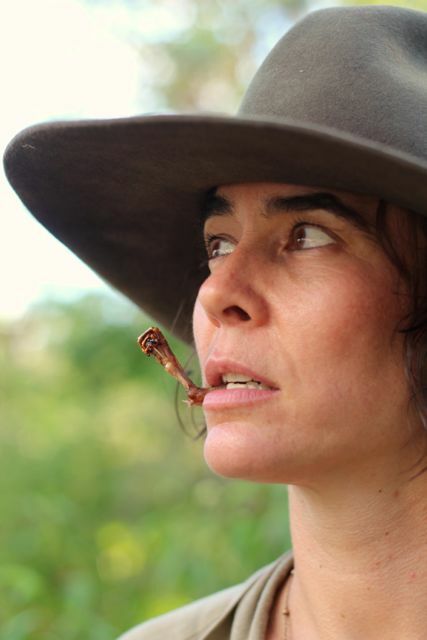 The department of Sugar Experiment stations was responsible, trying to keep the cane beetle under control in Queensland. Unfortunately these unfortunately ugly beasties went feral, covering the whole of Queensland by 1980 and reaching the NT in 1984 in South Kakadu, they made it to Darwin by 2004. There are reports that they are spreading further and further and studies show they are more numerous than ever before dispite various programs to stop their spreading and breeding and have just made it over the WA border. These ugly fellas parotid gland produces milky toxic secretion or poison that is dangerous to many species (bufotoxin) and kill other native species such as Northern Quolls, goannas, frogs and snakes. They outcompete other frogs and reptiles and are pretty detrimental to a lot of native animals. Anyway friends of GULP live further from Darwin, outside Adelaide River and have always been keen on experimenting with the cooking of road kill, including snakes and wallabies and also had an interest in the use of these ugly toads as food. Every year, at a wonderful ‘Fire Party’ social gathering that involves fire management- an early burn off in selected areas to protect later more intense fire, much great food is prepared and is often a bit of a focus. It is great to share food with friends. This year it was encouraged that meaty road kill or feral animals were prepared.Amongst the amazing dishes prepared were buffalo and wallaby stews and an array of toad dishes. There are just so many cane toads it is mind boggling, but they are also surprisingly easy to catch. The most humane way reported is to catch them by the back legs and whip them into a dark airtight canoe bag and then freeze them, you don’t want to stress them out, and after you have a few (they only have little legs) pop them in the freezer as quickly as possible. After sufficiently frozen thaw these guys out. With a meat clever or sharp knife, cut off their legs. Because of the fact these creatures contain poison in their back (and skin) you want to skin them and avoid the upper body. Apparently the more stressed, the more the poison is dispersed, so give them the most calm end possible! Anyway we discarded the body and put it in a hot compost- great blood and bone! 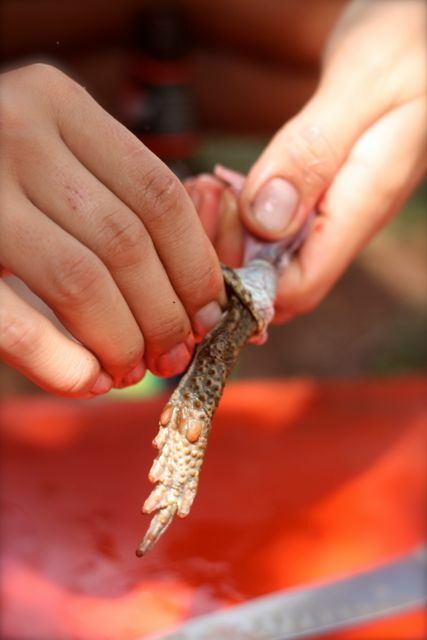 Then we skinned the legs- which is really easy. Several recipes had been made with the GULP team, I tried marinating them in soy, garlic, ginger and chili. After a couple of hours (in the fridge) I sautéed them in sesame oil and served them with heaps of local (Vietnamese coriander) and random salad greens, including sweet leaf and rosella leaves. Heat sesame seed oil in a wok on a medium heat. 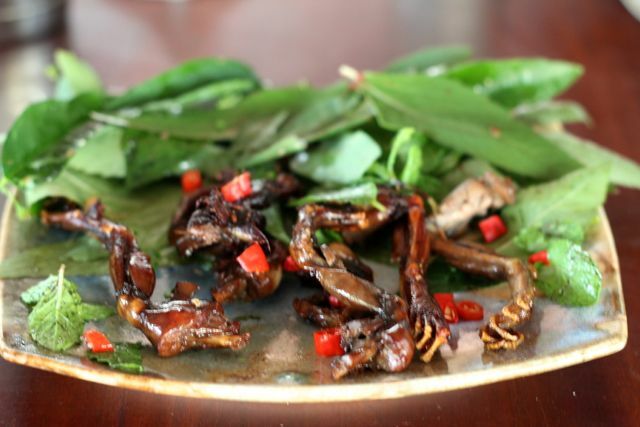 Fry toad legs for a couple minutes, add galangal and coriander, season with salt and pepper and cook for 5 minutes stirring continuously. Add kang kung and mix with plash of soy sauce until stems cooked. Serve as an entre for 2 people or meal for 1. Melt butter in a heavy based sauce pan and fry garlic until soften Add toad legs and cook in butter until tender Lightly toast the baguette Serve two toad legs on a piece of baguette, drizzled with garlic butter and garnished with chives. So guys, don’t just get out there and swerve for them or shovel these guys, if you are going to try some pest management, you might as well get some protein from this unwanted visitor. Just remember, allow them to have a quick death and treat them well, it isn’t their fault they were bought here! Secondly don’t poison yourselves, be very careful with skins and dispose of the body in a closed compost bin, away from other animals. Oh and what do they taste like- well a bit like gamey chicken. Disclaimer- GULP and members of, take no responsibility for people licking toads, these are cooking suggestions and we are just sharing our story. If you try, well that’s up to you! However, after hearing of this in the news I shall give the legs a try! Wasn’t sure about the prep but after reading the above am a little the wiser.. Not 100% sure where to make the break/cut tho but will go by the photo.